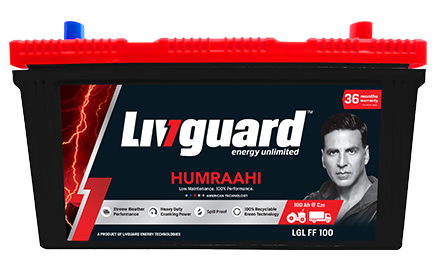 Livguard Humraahi automotive battery is designed to meet the high-performance demands of heavy commercial vehicles. It provides dependable energy for extremely demanding starting conditions and peak power supply in the toughest of scenarios. Improving both safety and comfort, it gives consistent performance to your Trucks and Tractors with aggressive energy demands. Specifically engineered to be ultra reliable, Humraahi is equipped with American technology to overcome the harsh working environments offered by the rough roads and varied climatic conditions.